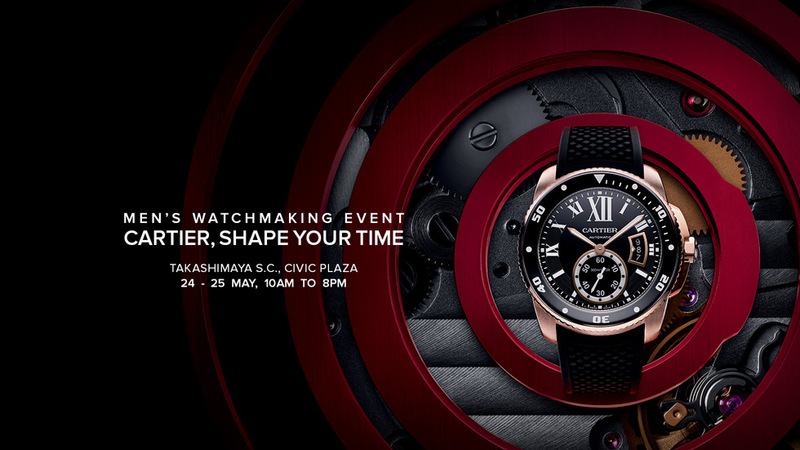 A showcase of Cartier’s contemporary watchmaking, the “Cartier, Shape Your Time” exhibition is open in Singapore from May 24 to 25 at the Ngee Ann City Civic Plaza on Orchard Road. The event is open to the public, with guided tours available. “Cartier, Shape Your Time” is an exhibition dedicated to Cartier’s key watch lines, most notably the iconic Santos and Tank, and also the official launch of the Calibre de Cartier Diver, the brand’s first ever true dive watch. The exhibition space is divided into five areas for each collection, including one for the Fine Watchmaking line of high complications, which includes timepieces from the SIHH 2014 collection like the innovative Astrocalendar. Multimedia displays, including touch screens, are on hand to explain Cartier’s watchmaking history, as well as its current creations. “Cartier, Shape Your Time” is open on 24 and 25 May 2014, from 11 am to 8 pm at the Ngee Ann City Civic Plaza on Orchard Road. It is open to the public, with guided tours available upon registration. VIDEO: Cartier "Shape Your Time"